Sho Kosugi redefines revenge in this martial arts classic! Pray for Death stars Shô Kosugi as Akira Saito, a humble businessman living in Tokyo and moving up the ranks in his field. His family life is a happy one, with loving sons and a beautiful and dedicated wife. When the family has an opportunity to relocate to America to start a new life and a new, family-owned business, Saito is hesitant: he’s heard how violent American cities can be. But his wife, whose father was American, urges Akira to take a chance on a new life as it presents a chance for their sons to learn about the other side of their heritage. Akira relents and the family packs their bags and move to the city, where they encounter trouble in the form of crooked cops who smuggle jewelry and other contraband in an abandoned backroom of the building the Saito family has purchased. When one of the cops decides to keep a priceless necklace for himself, the local crime syndicate puts the hurt on Akira Saito by attacking his family. Little do they know the quiet, unassuming businessman has a shadow lurking within his soul - the shadow of the ninja! When the gangsters push him to his breaking point and the local police are no help, Saito unleashes his personal demons on them. Handcrafting a new sword and donning his battle armor which bears more than a passing resemblance to the Shredder of Teenage Mutant Ninja Turtles fame, Saito seeks revenge and wages a one-man war on the criminals who shattered his American Dream. And it is awesome! 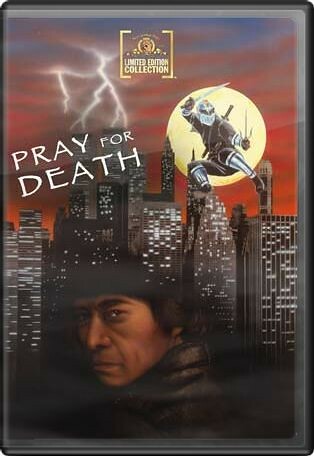 Pray for Death was released in 1985, during the midst of the huge ninja boom that captivated many kids of my generation and it is once again available as part of MGM’s Limited Edition Collection, which specializes in DVDs on demand. Revisiting this film will no doubt transport viewers to those halcyon days of the early '80s when throwing stars could be purchased at gun shows or in the back of martial arts magazines. The days when your parents constantly reprimanded you for the collection of holes you punched through the drywall in the garage with those devastating weapons or the time you whacked your little brother in the head with the homemade nunchaku you painstakingly crafted using dowels, electrical tape, and a bit of chain. If you recall that era, you likely don’t need to be reminded of how awesome this movie is or the power possessed by the mysterious and elusive ninja. If you’re too young to recall, or perhaps you simply missed out on this golden age, read on. Critics of the day no doubt hated Pray for Death and lambasted it as a mindlessly exploitative film featuring all of the violence of martial arts and little of the beauty. They likely criticized the excessive amounts of blood that looked a bit too much like melted red Crayolas and maybe they even thought Kosugi, as well as the rest of the cast, lacked any acting abilities. Well, those critics were wrong and it’s safe to say that this movie was simply too awesome for them to handle. It is a natural reaction for a weaker person to insult what he or she does not understand and honestly, who can truly understand the way of the ninja unless they have walked a similar path of violence and retribution? Fans of ‘80s power suits and Sheena Easton wannabes belting out corny songs about a return to the shadows will find a lot to like about this movie, as will aficionados of classic action and exploitation films. Featuring the kind of simple (some might say cliché) plot and down-to-earth (some might say low budget) production values, Pray for Death isn’t the type of film that is likely to have won many awards and it may struggle to find a new fan base in the modern era, but it holds a special place in the hearts of those who recall the heyday of the ninja. As a child of the ‘80s who, like many other young boys my age, was obsessed with ninjas, I couldn’t wait to watch this movie again. While it is no doubt (slightly) less awesome than Kosugi’s 1981 effort Enter the Ninja, co-starring Franco Nero and Susan George, Pray for Death is an entertaining, if somewhat mindless example of what I consider a far better breed of crappy action movies than the ones we are presented with today. No, Pray for Death is not Shakespeare. But who needs the Bard when you can watch a man get impaled with a piece of furniture and countless shuriken find their way into the skulls of unsuspecting bad guys? It’s not art; it’s martial arts. Honestly, which would you rather watch?